** I’M IN THE MIDDLE OF A CRISIS INVOLVING A LOVED ONE. THIS BLOG POST WAS PRE-WRITTEN. Frontierado is Friday, August 5th! My most popular Frontierado articles over the years have been the ones about neglected gunslingers of the American West. Here is another neglected western figure whose life was at least as interesting as those of the bigger names. 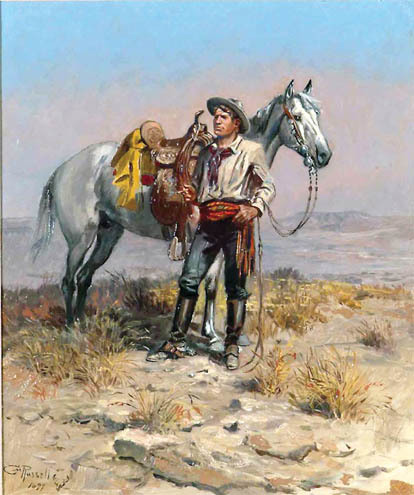 KID RUSSELL – How cool is it that an authentic, acclaimed international artist spent some of his younger years wandering the Wild West, even earning the nickname Kid Russell? Charles Marion “Kid” Russell was born in 1864 in St Louis, Missouri. As with Klondike Kate Rockwell, most of this figure’s life story is outside the purview of this article. 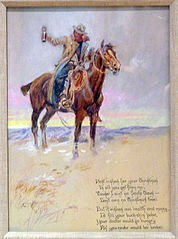 Since Frontierado is about the myth of the Old West I’ll focus on the legends about Kid Russell’s wild, wandering younger years full of guns, ranches, saloons, cattle drives, bordellos and sketches drawn on any nearby flat surface, sketches that showed the nascent talent that would one day make Russell world-famous. When he was age 16 Charles’ well-to-do parents gave up trying to force him to continue his schooling and let him move to Montana, where, clad in a brand-new buckskin outfit, he worked on a friend’s sheep ranch north of Helena. It took skill with a gun and a true survival instinct to live through encounters with rustlers, hostile cattlemen and their hired gunmen but Charles, already being called Kid Russell, thrived and felt more at home in this rough and tumble lifestyle than among his family’s hoity-toity friends in St Louis high society. Eventually the Kid’s fondness for the western landscape caused him to while away too much time with his sketchbook and not enough watching his employer’s livestock and he was fired. Always quick to forge new friendships Russell became an assistant for Jake “Lucky Boy” Hoover, a former prospector turned trapper, guide and professional big game hunter. The Kid and Lucky Boy would sometimes be paid handsomely to guide hunting parties of European and Russian blue-bloods and tycoons. 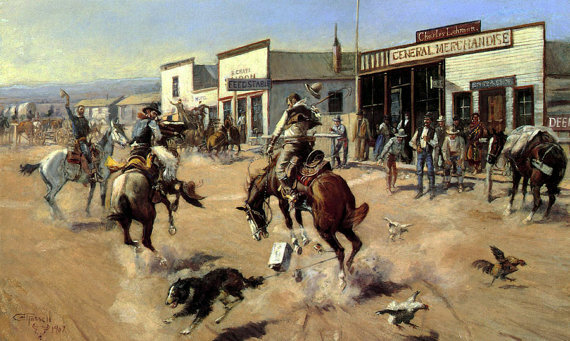 (Helena, MT was a magnet for adventurous royals at the time) Of necessity gunplay was sometimes called for to drive off Indians who didn’t want to negotiate and/or outlaws wanting to rob the wealthy customers of the duo. Operating out of Lucky Boy’s headquarters along the Judith River near Utica, MT, Kid Russell became even more skilled at stealth and wilderness survival skills. Eventually those skills earned Charles a role in the highly dangerous job of night-wrangler for the legendary Horace Brewster, the boss of the annual Judith Basin Cattle Roundup. The Kid’s ninja-like night skills earned him the praise of no less than Indian Charlie Contway, one of Brewster’s best hands. He was now skilled at wrangling cattle as well as at gunplay. Russell was now a very employable Cowboy, but he spent a great deal of his time in Helena, MT, gaining a reputation as a Herculean drinker and as a regular customer at the brothel owned by THE Josephine Airey, Chicago Jo(e) herself! The Kid’s favorite saloon girl was called Dutch Leina and the pair partied hard, not only at saloons but at opium dens in the dangerous Chinese part of Helena. Kid Russell spent the 1880s living a life filled with danger, danger which claimed the lives of many of his friends. The Kid survived instances of gunplay during saloon card games unlike his pals Charlie Bowlegs and Panhandle Jack, both shot to death. The Kid survived the bullet-filled perils of night duty on cattle ranches, unlike his friends Pat Riley, Al Malison and Frank Harstel, victims of rustlers, bushwhackers and other violence. When one of Charles’ well-to-do cousins from St Louis came to Montana for a visit he died of mountain fever after a few weeks. Even Russell’s favorite saloon girl Dutch Leina one day committed suicide, overdosing on morphine but leaving no note. The Kid was distraught for weeks over her passing, but, surrounded by many forms of death as he was, he still kept returning to his art through it all. Russell sold some of his artwork here and there and the general consensus from Helena to Utica was that if the Kid didn’t drink himself to death or get gunned down he would probably become a famous artist. Heavy paydays from commercial artwork in Helena fueled Charles’ renewed romance with his old sweetheart Laura “Lolly” Edgar, but, when she returned to St Louis he lost her to the high society boys despite their continued correspondence. Kid Russell’s art received its first nationwide exposure as a result of his searing depiction of the havoc the winter of 1886 into 1887 had played on the cattle of Montana. In May of 1888 the Kid was an accomplice to Phil Weinard when he eloped with Chicago Jo’s niece Mary Ferris. Charles was supposed to serve as Best Man, too, but was too hungover to show up in time. After the ceremony Mary was sent to Alberta, Canada by train while Phil was guided there on horseback by Kid Russell and one of the Kid’s few surviving friends – professional gambler B.J. “Long Green” Stilwell. Over the next two weeks the three men survived heavy rains and flooded rivers while evading or skirmishing with hostile Native Americans on the way. One clash resulted from a tragic misunderstanding when an Indian child’s corpse fell into their midst from its funerary position high up in a cottonwood tree. Another supposedly involved the Kid and Stilwell, a band of Blood Indian horse thieves and the Canadian Mounties pursuing them. When the trio reached Alberta, Phil rejoined his bride while Kid Russell and Long Green Stilwell stayed with a British rancher in the town of High River. Alberta had outlawed alcohol, prompting the forever-thirsty Russell and his drinking buddy Stilwell to spend a few months involved in bootlegging with the nearby tribe of Blackfoot Indians. Soon our hero was living with the tribe, churning out sketches and running bootleg liquour while occassionally avoiding pursuing Mounties in the Alberta Badlands. That bootlegging venture was so successful that the Chief offered his daughter to Kid Russell as a bride. Charles diplomatically disentangled himself from the situation and years later joked that he didn’t go through with the marriage because he didn’t like the way the prospective bride cooked dog meat. Back in Montana in 1889 the Kid found Helena and the Judith River Basin to be getting far too settled and civilized for his taste and he wandered for a time. Rumors had him hiring on to shoot rustlers in Wyoming or running whiskey into Utah while dodging or clashing with the Mormon Danites, any number of things. In 1892 the Kid set up a studio in a spare room at the Brunswick Saloon in Great Falls, MT, determined to earn a living as an artist. Despite his poverty, in 1895 the struggling artist supposedly turned down an offer to hire out his gun in the Cassia/ Elkins Range War in Nevada and Idaho. In 1896 the 32 year old Russell married 18 year old Nancy Cooper, a pretty young girl with a questionable past but a definite flair for business and promotion. With Nancy as Kid Russell’s agent he became world-renowned as a master of American western art and sculpture. Silent film stars like William S Hart, Tom Mix and Douglas Fairbanks later became friends of Russell and his wife. 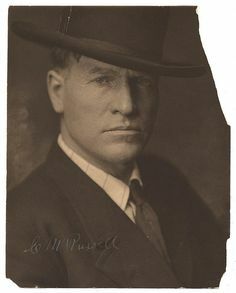 Charles Marion Russell passed away in Great Falls in 1926 and the schools and businesses closed down to observe his funeral. Such a sad life at times but it turned out okay for Kid Russell in the end. Yes, it most certainly did. I love the style of his painting, it is like viewing these scenes as they happen. I agree! He was very talented! Awesome! What a interesting painter! I agree. And he sculpted, too. I would love to see someone do a movie about Kid Russell! This blog post of yours got me into Russell’s artwork.